For good reason, conventional and organic farmers alike are looking towards winter feeding with a degree of apprehension. Will there be enough forage to last the winter? What will be the availability of raw materials for manufactured feed, and how much will it cost? It is hard to predict precisely how much pressure there will be on forage stocks and raw material supply this winter, but recent rainfall has certainly alleviated the situation to an extent. Six weeks ago at the height of the heatwave it was debateable whether a further cut of silage would be achieved at all. The early August rains have at least ensured most farmers will take an additional cut, albeit for some only the second of the year. A good spell of sunshine following the rains means late cut yields look on the whole promising. When looking at concentrates, it should be remembered that the heatwave affected most of Europe. Notably countries such as Ukraine experienced the same reduced yields of wheat and other cereals as the UK (proteins such as rapemeal will also be affected). Nor are crops in the southern hemisphere expected to do particularly well. The immediate problem seems to be one of uncertainly as to how the bigger picture will unfold, and matters are not helped by a weak pound sterling against both the Euro and the US dollar. But the position is by no means all gloom. While the 2018 UK cereal harvest was one of the earliest on record with reduced yields, it was by no means a failure [early figures indicate wheat yields are 5 – 8 per cent below the five year average of 8.2t/ha (3.3t/acre)] and quality has been reported as good. A good world maize harvest is predicted, especially in the US (an increase in maize gluten will help compensate for a shortfall in other mid-protein ingredients) and a flattening in the price of soya means that the predicted rise in feed costs should not be as alarming as some feared. An additional factor to the lower cereal yields, is the amount of conventional wheat, for example, finding its way into anaerobic digestion. Critics question the wisdom of consigning large volumes of feedstocks for biogas production (in the case of conventional wheat, estimated to be as much as 2 million tonnes in some years). Criticism of the practice is heightened when the price of wheat is high relative to the price of ethanol, as is the case now. The organic livestock farmer faces the added burden that bought in forage must be appropriately certified – especially difficult at a time when forage is scarce even for conventional farmers. But on a positive note, H J Lea Oakes has the advantage of ready access to oats and oatfeed – a particular advantage for organic farmers. Taking oatfeed as an example, its inclusion in the right quantities is a valuable home-produced component of the diet and relieves, at least in part, the burden of any organic raw material shortage. Its use also helps avoid overreliance on just one fibre source, which can have a nutritional downside as well as making the feed difficult to compound. And in addition to extending the spread of raw materials, it introduces a vital second or third fibre source – extremely important when supplementing grazing and grass silage. Further, oatfeed is beneficial in balancing the high starch levels of maize, which is set to be a prominent feature in organic diets this winter – and its high fibre content complements oil-rich ingredients such as soya and sunflower. The rain came for many in the nick of time. To sum up, the rain came for many in the nick of time. It did not solve the forage crisis, but made it more controllable, with most managing to get that extra silage cut they thought might have eluded them. But results were mixed. Whereas crops in some areas recovered quickly from the toll of the heatwave, farmers from other areas as close as 20 miles away have a different story to tell. Also, the full worth of the autumn silage has yet to be evaluated. We know that the European harvest is down on recent years, and there are question marks about the global position. However, to an extent yet unknown, the shortage of some raw materials will be offset by the good supply of others. 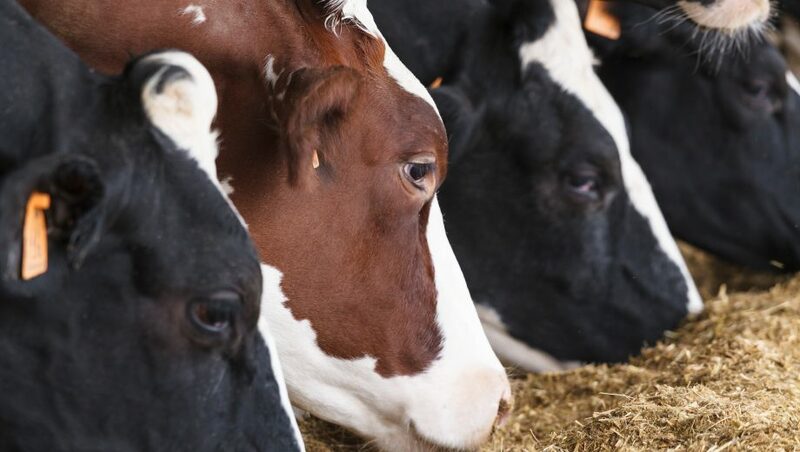 There is every reason to believe that the challenges of the winter will be met through careful management of forage and specialist ration formulation, both on farm and at the mill.